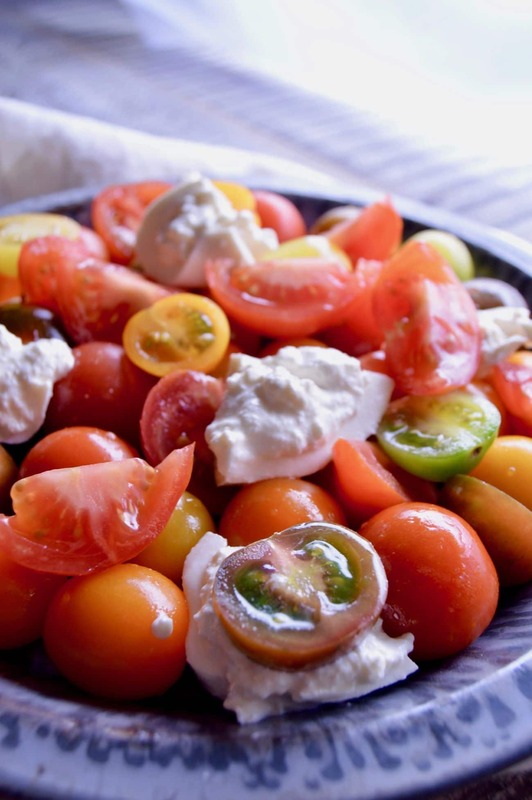 Take advantage of the season, make this Fresh Tomato and Burrata Salad recipe! The tomatoes are sweet and juicy, the fresh burrata mozzarella is creamy and delicious with the added salted crouton for that perfect crunch to hit on all of your food cravings! I love farmer’s markets. The things you can get there are absolutely amazing. One of the best ones I’ve ever been to is in Santa Monica on the Promenade. There is a long wait list and people wait for years to be able to have their booth there to market their products. Many Chef’s from Los Angeles restaurants go there to shop for the best produce, nuts, oils and breads to serve in their restaurants. It’s almost always on my list of things to take people to see when they come to visit. My favorite time of year to go…… tomato season. When a tomato is in season it’s crazy good. It’s perfectly ripe, juicy and sweet. I mean look at how juicy and colorful just the tomatoes are here? I don’t have many regrets in my life, but deciding to not like tomatoes as a child is one of them. My grandma had a green thumb and her garden was spectacular (one I would kill to have today!) She could grow anything. What I wouldn’t give to go back and eat those fresh tomatoes right in the garden. I can remember her eating a tomato right off the vine, like an apple. I was appalled. It completely freaked me out as a child. Today, tomatoes are one of my favorite things. The smell of the stem when you pull it off, oh my goodness, amazing. You can get tomatoes at farmers market that are so fresh, probably picked just days before you’re able to buy them. This time of year I like to make a simple tomato salad….thus this recipe Fresh Tomato and Burrata Salad! It doesn’t need a million bells and whistles. Just a few quality ingredients: fresh, sweet tomatoes, simple croutons for a nice added crunch and fresh burrata cheese cut over the top. Then drizzle a little bit of balsamic vinegar over the entire salad to accentuate all of the crazy fresh flavors you’ll taste. The croutons can be made in the oven with just olive oil, salt and pepper. If you’ve never had burrata, you are in for a treat. 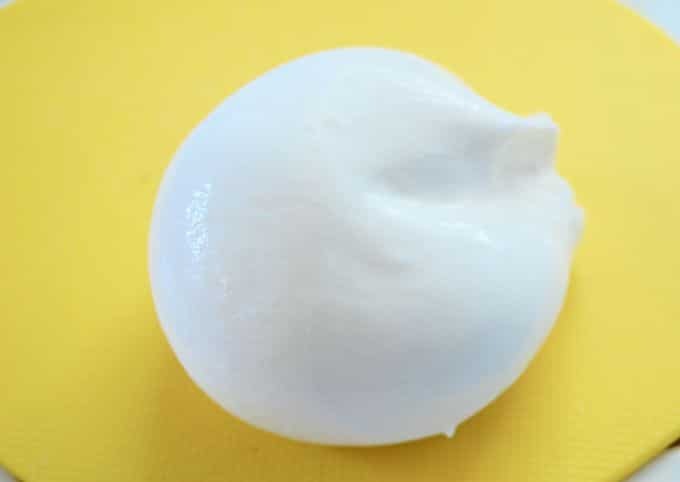 Burrata cheese is a type of Mozzarella. The mozzarella is made into little pockets/balls that have a center they fill with cream. When you cut into the cheese, the center is soft, creamy and delicious. You can find it at grocery stores. Trader Joes sells one that it is reasonable and quite delicious. When you put these simple ingredients together it just sings. 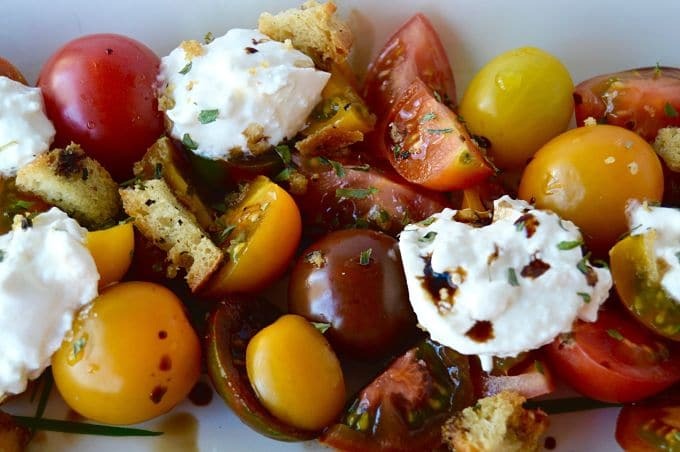 The tomatoes are juicy and sweet, the croutons add the crunch, the burrata is so creamy delicious…..all topped with the tangy balsamic vinegar for a delicious and simple salad! It also works great at an appetizer at any get-together! Are you looking for other fresh salads with Burrata… also check out this Tomato, Nectarine and Burrata Salad from Umami Girl and since Nectarines are so good right now you could also make this recipe from Joy in Every Season for Grilled Nectarine and Burrata Salad ! Need a perfect summer salad that's easy to make and plum full of summer flavor? This fresh Farmers's market tomato and burrata salad is just the thing to make. The fact that its made from good, healthy ingredients is just icing on the cake! Place pieces of bread onto a baking sheet. Drizzle olive oil over the top of cubes, then with your hands or a spoon toss until cubes are evenly covered. Bake at 275º, turning every 15 minutes until golden and crunchy. Usually about 30 minutes. Cut Burrata ball into 1/4's, being careful to not lose much of the creamy center. Place burrata atop the tomatoes. (I usually space them randomly so each serving is able to have a piece of burrata. Sprinkle Croutons over the top evenly. Drizzle with your favorite Balsamic vinegar. Serves 4 full servings or 6-8 side portions. 1. 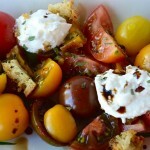 Use whatever is your favorite...I use heirlooms, and assortments of multi colored grape tomatoes. I cannot wait for fresh tomato season! Fresh local ripe tomatoes are the BEST! That tomatoes looks fresh and delicious! This is the salad of my dreams! You have inspired me to check out the Dallas Farmers Market this weekend. Oh goodness, this looks amazing. Seriously. So cool and refreshing. I always feel the need to eat that way when I get sick so this is perfect timing! I’m making this to go with dinner tomorrow. This looks delicious and healthy. your photos are gorgeous too. O-M-G, this looks soooo good! I absolutely love tomatoes and mozzarella cheese. I seriously eat both as a snack all the time. First of all this looks absolutely delicious! Secondly, I think I need to make a drive up from Orange County to the Santa Monica farmer’s market…I love exploring new farmer’s markets! I’m obsessed with burrata. i’ve had some failures at making homemade mozzarella and keep trying because i want to get to the point where i can make my own burrata. it can be sooo expensive at the store. This looks amazingly delish! 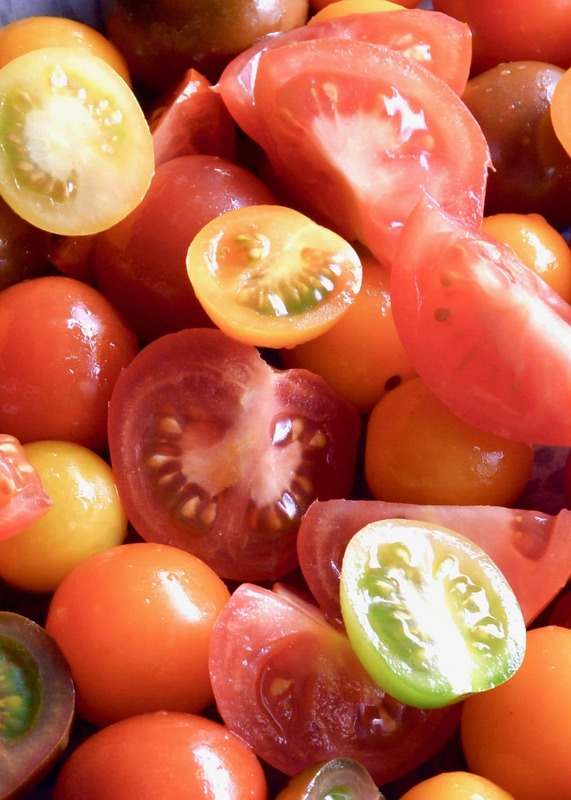 We are all about eating our rainbow lately and these beautifully colored tomatoes do the trick at our house! I absolutely love tomatoes – it is one of my favorite things to grow every summer. I typically plant 15-20 plants, and hope that pests leave them alone (I spend a lot of time canning tomatoes for the winter). But, fresh, off the vine tomatoes are my favorite! I have never heard of burrata before, but I am definitely going to have to find it! This looks amazing! We still have several months before tomato season here (early August), but this will definitely be on the list of to make! This tomato and burrata salad is awesome! Thanks for sharing! I also love going to the farmer’s market. Fortunately every summer my city has one on Thursdays. Whenever I shop there I am inspired to make delicious veggie meals! One of them will definitely your recipe! You had me at burrata. Caprese is a favorite of mine, so I can’t imagine that I wouldn’t like this just as much. I’ve never had burrata before, but it sounds delectable! My husband will be at the farmer’s market this year selling range free eggs and organic produce. WE are huge fans of the farmer’s market and fresh stuff! Your recipe looks amazing. Oh my god this looks so yummy I could die. Great ideas for mixing up the boring old salad. I’m so so excited for tomato season. There’s nothing like fresh tomatoes from the garden. I’ve never tried Burrata but it looks like I need to. Burrata cheese is a favorite here. I’m so anxious for fresh tomatoes! Right now I’m making my salad with burrata , snap peas and peppers I canned last year. That is so mouthwatering! Like honestly you have me drooling over here! I’m definitely pinning this for later! I normally don’t get into salads that much, but that salad looks beyond amazing! I also love that tomatoes are in it – my favorite. Omg yum !!! Definitely mystyle and our farmers market just opened must try ASAP. This looks fresh and amazing! I love anything that uses fresh ingredients, especially some of my favorite ones! Oh yum! I dont like tomatoes but I know plenty of people who do! I try them every year and so far no luck on liking them! I am absolutely drooling over here. That sounds wonderful and I am sure my whole family would just love this. Love all the fresh and flavorful ingredients! Love love, love this salad. Wish I had a bowl full right now! I’ll have to make it this weekend, yum! What a beautiful salad! Can’t wait until our Farmers Market opens this spring! Great recipe! What a great textural salad – the cheese is wonderful and I really like the crunch the croutons give. I agree with everything in this post! I love LOVE farmer’s markets! And I too hated tomatoes as a child but are now loving them as an adult! LOL! This salad looks amazing and I just want to eat it right out of pictures! Can’t wait to try this!